Office 365 distribution groups are a very useful tool. They allow you to have an email address without having an actual mailbox for it, and thus not using up an Office 365 license. Instead emails that go through an Office 365 Distribution Group get distributed to the users of the group and can be filtered in a few different ways. To create a new Office 365 Distribution group, you should first log into the Office 365 portal as the administrator and click the “Manage” button under “Exchange”. Click the “Distribution Groups” tab, and you will end up on the page below. Click the “New” button to form a new Distribution group. On the following page, you need to give it a Display name, an Alias, and an email address. You can also add a description. Next you need to add at least one group owner and one group member. Under “membership approval” you can choose whether members can join the group themselves or if group owners need to add/approve them. The same choices can be made for leaving groups. Once you have created a group, you can select it and click the “Details” button for even more options, as you can see pictured below. 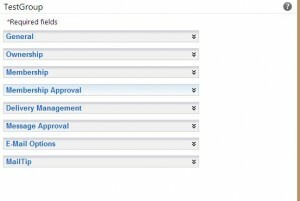 Additional options now include “Delivery Management”, which let’s you specify who can send to these groups. By default only members within the organization can send to Office 365 distribution groups, but you can allow for senders outside the organization as well. You can also specify individual senders that are allowed to send to the group. 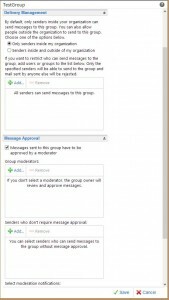 Under “Message Approval”, you can allow for moderators that have to approve a message before it is delivered to the entire group and you can allow for exceptions to this rule (specific senders that don’t need approval. Lastly there are “Mailtips”, which are just messages displayed when sending to a specific group. As you can see, Office 365 distribution groups offer a lot of very powerful and granular options for delivery that can be very useful within a large organization. Hopefully this gave a helpful guide and explanation of the options available to you.